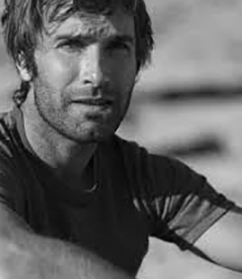 Chris Sharma’s preternatural climbing ability and visionary first ascents have earned him an enduring reputation as one of the world’s best rock climbers. This American professional athlete, ambassador and entrepreneur from Santa Cruz, California, has been on a global odyssey, now two decades in the making, in search of the planet’s most difficult and beautiful rock climbs. Sharma has dedicated years of his life to discovering and climbing singular, aesthetic and seemingly impossible routes—always with his humble, meditative approach and powerful, dynamic style of movement. Today he continues to climb at the world standard, pushing the limits of what’s possible and always reimagining the direction of his remarkably storied climbing career. Sharma’s contributions to the sport are numerous; including climbing the first routes rated 5.15a and 5.15b in the world, and establishing the grade of 5.15c. Over the years Sharma has popularized various genres of climbing, from bouldering to sport climbing to “psicobloc” (aka deep-water soloing). Psicobloc involves climbing ropeless up the sea cliffs of the Spanish island of Mallorca with nothing but the ocean to protect you in the event of a fall. His signature route here is Es Pontas, which climbs the underbelly of a magnificent arch in the middle of the ocean. Sharma has been a leading force in the climbing industry. He is the lead shoe designer at Evolv, and has developed several award-winning models of climbing shoes. He is a founder of the PsicoBloc Masters—the first and only deep-water solo competition in the U.S. In 2013, Sharma partnered with his sponsor Walltopia and opened his first signature rock-climbing gym: Sender One, in Los Angeles, California. With 25,000 square feet of climbing space, Sender One is the premier indoor-climbing facility in Southern California, and one of the many ways that Sharma, who discovered climbing for himself in a gym, is giving back to the community.